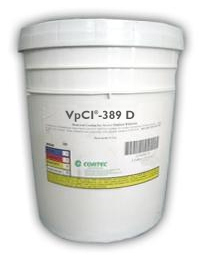 Cortec VpCI-389D is an already diluted version of VpCI-389 so it saves time and mixing. VpCI-389D is a water-based, temporary coating which provides excellent protection for outside applications and salt-spray resistance. VpCI-389 D is an environmentally friendly replacement to oil-based products. VpCI-389 D is an excellent choice for long-term, indoor protection (up to 5 years*) and short to medium-term (6-24 months*), unsheltered, outdoor protection. This product cures to a soft film and eventually hardens. VpCI-389D can be easily removed with alkaline cleaners, such Cortec VpCI-414. Available in 5 gallon steel pails (Cortec Product Code 12300529) or 55 gallon metal drums (Cortec Product Code 12300530). 5 gallon drum weighs 50 pounds and ships under our standard shipping rates. The 55 gallon drum must be shipped by truck. We will provide you with a freight quote before we ship this product. Do not let product freeze.